Dactyloscopy isn't going anywhere. 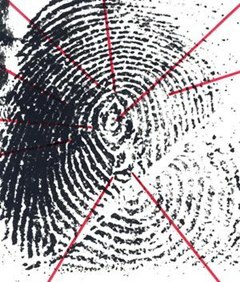 Forensic science has much relied on fingerprinting as a means of identification, largely because of the massive amount of fingerprints stored in the FBI's biometric database (IAFIS), which houses over 150,000 million prints. And thanks to the departure of messy ink-stained fingertips, biometric analysis isn't just for solving crimes anymore. These days, commercial fingerprint scanners are used primarily for granting entry access, and you can find them in banks, gyms—even your own laptop computer. But pressing those oily fingertips against sensor-screens isn't a foolproof method of identifying and granting access. Touch-free systems are the wave of the future, and one of the best ones yet comes from Advanced Optical Systems (AOS). The device is called AIRprint. AIRprint is about the size of a tissue box, housing two 1.3 megapixel cameras and a source of polarized light. When initiated, the AIRprint scans a subject's hand finding one fingertip. Once locked on, it shines a polarized light onto the area. One camera then detects horizontal polarized light (the ridges) and the other vertical (the valleys). AIRprint's cameras capture the images at 500 pixels per inch, combining the two into an accurate fingerprint, sending the information to a computer for verification. The scan is super quick—0.1 seconds, with the processing at 4 seconds. W hat's the best part? The device can capture fingerprints from almost 2 meters (6.5 feet) away and it can take advantage of those massive fingerprint databases, something that iris and facial recognition databases will take decades to match. Though the initial implementation of AIRprint scans only one fingertip at a fixed distance, something that would definitely prove useful at security checkpoints in places like Iraq and Afghanistan, it's only a matter of time before these devices can capture the fingerprints of all five digits—from moving targets. AOS hopes to have this available by the end of this year. Imagine waving your hand to enter a building instead of unbolting a few locks, swiping your ID card or punching in a password. It could revolutionize the way we enter buildings and rooms. AIRprint can also be linked to a timecard system, which could unjam large lines in massive manufacturing plants. And airport security is sure to implement similar technology in the near future, to help identify every questionable air traveler that could pose a threat (maybe even those that don't). "It is a step closer to being able to verify an individual's identity from a safe distance with or without their knowledge. As with all new technology, the hope is further advancements will follow and increase the standoff distance," says Jeremy Powell, head of identity operations at Marine Corp Headquarters. "This could potentially allow Marines to positively identify a target before engaging or conduct 'standoff' screenings from the safety of an armored vehicle." But this spy-like gear could mean the start of a huge privacy violation—do you really want your fingers scanned without your knowledge? If these devices end up everywhere, there could be a giant, secret log that records your every move. This could easily benefit advertising companies, with them paying top dollar to see where you eat and shop. Maybe it will even be able to connect to Facebook one day, so your friends will always know where you're at. But it's doubtful. Maybe in twenty years.